Chemical studies of old English coins are helping unravel a centuries-old mystery: What happened to all the silver that Spaniards dug out of the New World? Silver from Mexican mines started being incorporated into English coins around the mid-1550s, a new study shows. But silver from the legendary Potosí mines, in what is now Bolivia, didn’t show up until nearly a century later, researchers report online November 6 in Geology. The new study adds hard data to theories linking the transatlantic influx of silver to price inflation across Europe from about 1515 to 1650. Minerals such as gold and silver contain a chemical fingerprint of where they were born, for instance in the composition of copper and lead that appear along with the more precious metals. 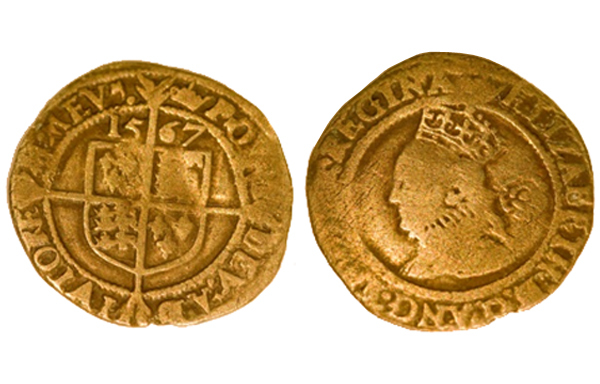 Anne-Marie Desaulty and Francis Albarède of the Ecole Normale Supérieure in Lyon, France, analyzed 15 English coins, dated between 1317 and 1640, for variations in their copper, lead and silver. Lead in all the coins before the reign of Mary I, which began in 1553, showed that the ore was at least 220 million years old, suggesting it came from ancient rocks in either central Europe or England. Lead in later coins showed a much higher contribution of silver younger than 50 million years old — suggesting it came instead from the mines of Mexico. The coins show very little hint of Potosí silver, which has a distinctly different lead signature than Mexican ore. That’s surprising, Desaulty says, because the Potosí mines were churning out far more silver at the time than Mexico was. Geography may explain this, she says: It was easier to ship Mexican silver eastward to Europe than to get Potosí silver across the breadth of Brazil. Instead, Potosí silver went west, from Lima to Acapulco and onward to markets in China. Scholars have known of this westward trade route before, which probably didn’t become really important until the early 17th century, says John Munro, an economist at the University of Toronto. It’s not yet clear whether these particular English coins reflect a larger trend across Europe. In work published last year, Desaulty analyzed Spanish coins and found that they contained very little silver from either Mexico or Potosí until the 18th century. But Maria Filomena Guerra, of the Centre de Recherche et de Restauration des Musées de France in Paris, has used a different technique to analyze chemical elements that appear in trace amounts in Spanish, French and Italian coins. She found Potosí silver reaching Spain around 1570, and France and Italy in 1575. M.F. Guerra. The mines of Potosí: a silver Eldorado for the European economy. In Ion beam study of art and archaeological objects. European Commission, 2000.